Aguri Flower Park (あぐりパーク嵯峨山苑) is one of the great Sakura spots located in Matsuda Kanagawa. It is located on the top of 285m tall hill that has a great view of Kanagawa, Mt. Fuji with beautiful Cherry Blossom. It is also known as the spot of Field Mustard. 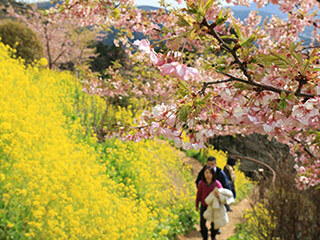 Around the middle of February to March, you can enjoy the harmony of pink and yellow flowers. Season: From the middle of February to the middle of March. 1. use Odakyu Line to Shinmatsuda Station. Aguri Flower Sagayam Garden is one of the great flower garden located in Matsuda, Kanagawa Prefecture. Because the garden is located on the top of the hill that is 230m to 285m high from the sea level, it has a great view of Kanagawa area and Mt. Fuji. It is known as the Field Mustard spots with beautiful Kawazu Sakua and Mt. Fuji. Kawazu Sakura is known as the early blossom Sakura that bloom in February. You can enjoy field mustards from January to April. From February, you can also enjoy cherry blossom till April. In May, beautiful Azalea blooms.